In the small town of Hermitage Pennsylvania, by the border of Ohio near Youngtown, a publication is being put to bed, that is looking to transform the nature of parenting magazines as we know it. Welcome to the world of Primal Parenting Magazine. The magazine seeks to redefine the “mommy and baby” slant on traditional publications by creating a whole family, and family first direction on looking at modern parenting. “We plan to feature a fathering and grand parenting column, as well as features on different races, cultures and types of families.” says Dena Smith Givens, Co-Founder and Publisher, who with her husband/business partner Rich, and their five kids combined are the living metaphors for the Primal Parenting movement. The magazine has been in development for the last decade and a half, conceived after the birth of her first child. “I realized I was new on the parenting journey, and as a young mom I definitely felt discriminated against. Mothering felt like a one size fits all, much like maternity clothes of the day. But I felt different, and unique and felt unheard and began collecting my thoughts and experiences for a book. After five or six years, we decided the book, would be a magazine.” Givens said. The magazine is based on five core Primal Parenting principles, including; healthy diet, alternative health care, natural parenting, sustainable living and educational alternatives. The magazine seeks to bring readers back to where the heart of the home is, in the relationships that define it. The publication includes exploration of the extended family unit and explores lives of step parents, interracial parents, gay parents, adopted parents, all forms and all backgrounds – defining instead by the heart of the family, than the structure, color, or social position. Givens brings to the publication a wealth of experience in mindful parenting and natural living. Givens spent thirteen years as a volunteer leader for the La Leche League, was founder of several nature food co-ops and natural parenting groups, she home schools her three and five year old, and is a licensed massage therapist with a background aromatherapy. Givens is the embodiment of the heart of Primal Parenting. With the magazine set to launch in a few short days, readers can order their copies of the inaugural issue now online on the Primal Parenting Site. 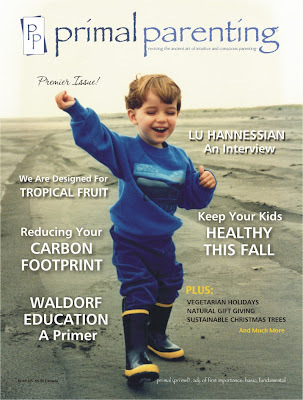 Primal Parenting will offer a FREE magazine to all Lohasian readers with a 50% discount on all subscriptions. Just send and email to subscribe@primalparentingmagazine.com with "Code: The Lohasian" in the subject heading to take advantage of the offer. In addition, The Lohasian is very proud to announce that it will be collaborating with Primal Parenting Magazine. Starting the week of November 26, 2007, the publication will have a featured column on The Lohasian, providing an insider perspective on primal parenting from “the inside out.” Also, check out Primal Parenting Magazine for “The Lohasian Arts & Culture Review” column, delivering a look at the creative culture behind mindful living.